Historical records reveal at least five renditions of the name of the town. Four years after the creation of the suffragan diocese of Cebu in 1595, Fray Gaspar de San Agustin, OSA, in his Conquistas de las Islas Filipinas listed Boljoon as one of the many parishes under the jurisdiction of the Augustinians in the Province of Cebu in the year 1599. Bermejo himself was said to have taught the local women cotton weaving and if Fray Gaspar's writings are to be considered, then Bermejo already found existing cotton cultivation and weaving industry in Boljoon. Boljoon is 103 kilometers from Cebu City to the southeastern part of Cebu Province. The name of the town is derived for the local word "Bolho" which means springs of water. The town is centuries old. According to oral tradition, pilgrims from as far as the town of Dalaguete visit the Virgin of Bolhoon during her annual feast to attend mass in the town's Catholic Church. The Parish of Boljoon was returned by Jesuits in exchange for "Liloan", Cotcot and Maraling", the last Augustinian Parish Priest of Boljoon, Fray Leandro Moran, OSA, turned over the administration of the parish to the Archbishop of Cebu on July 1, 1948. It was not clear as to reason for the delay when the last Augustinian Parish priest of Boljoon. Fray Leanfdore Moran, OSA, turned over the administration of the parish to the Archbishop of Cebu on July 1, 1948. What is now Daan Lungsod was the original site of Oslob. It was a favorite waterhole of both natives and travellers alike for its fresh waters were cooled by the huge branches of a nigad tree. The Castilian took it as the name of the place. 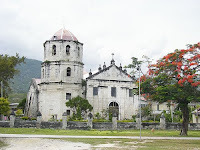 The churches of Oslob, Boljoon, Dalaguete and Argao were part of a defense system against Muslim invaders. They were not just churches. 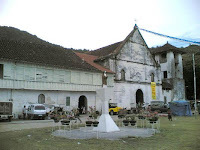 The tower and cemetery were built by Fr. Mauricio Alvarez. He also built the municipal tribunal and municipal church. Long time ago, there was a popular place in town called “Bolocboloc”. The place was called Bolocbol because of its existing spring located beneath the shoreline at the foot of the barangay. The flow of the water was so strong as if the water was boiling which can still be seen at this present time. At present, the place is now known as Nigad (a name of a tree). The place is named Nigad because of the existing tree that grew in the place which is seldom seen to grow in the shoreline. From the name Nigad the word “Oslob” was born due to the misunderstandings between the native couple and the two guardia civil (civil guards) in the year 1785. While the said couple were taking a rest under the tree and were eating their brought boiled bananas soaking it with vinegar and salt, the two guardia civil suddenly appeared with the words, as if they were asking: “Como se llama esto pueblo?” – which if translated in English would mean:”What is the name of this town?”. The couple was astonished for they were not able to comprehend what the civil guards were saying. Since, the couple, at that time, were then soaking bananas with the vinegar and salt, they thought that the civil guards were asking them as to what they were doing, and thus, the couple answered in unison saying ”Toslob”, which means “soaking”. After hearing the word “Toslob”, the civil guards kept on repeating the word “Toslob” in the thought that the said word was the name of the town. This has been the start of the word “Toslob” which was later changed to “Oslob” due to the passes of time. Until now, the flowing of the water at Nigad was still there quenching the thirst of the many people of the place including the nearby inhabitants specially when there is a shortage of water.